Without support from other +Action +Money cards, one copy of this card gains you a card costing up to $2, which seems *really* weak for a $5. Multiple copies let you gain a bigger card, but at the cost of also copper-stuffing yourself. I think at least it needs "You may". I'm not getting why you would ever buy Banner. It does nothing for you at all on play, compared to Embargo's $2. And then, while Embargo can hurt or shut down an opponent's strategy if it's different from yours, Banner only affects the first time they purchase the card, and even then instead of giving them a Curse, it gives them a one-shot terminal. Or you could put it on the pile you want to buy to make it only cost $4 instead of $5 or something, maybe that was the intent? Although then it's just a terminal Copper. I'm not sure when you would ever actually want to spent the money and action space to get one. This is coming back to how it first was, though without the Treasure playing. I hadn't considered that was why it was too good, so I will give this a go. Thanks. I have looked at Town and Road, and they are good. Champion as you say is the main snag, so my only real question with them is, is a Town-Page opening broken? Just saw your last post, agree with 'you may'. So what are your thoughts on the Gathering type? I find the text on the cards to be self-explanatory, but I suppose it's easier for players to see 'gathering' and think 'we put VP tokens on this pile then'. This is what led me to do the Multi type. It's easier for newer players to read 'Multi' and think 'this is a card we can use more than 1 action on' than read the text. I can also save card space by not having to write common rules about applying -1 action on each card. Do these in either order: +3 cards; look at the top 5 cards of your deck, discard any number, then put the rest back with any number from your hand in any order. At any time during your Action Phases, you may discard this from your Tavern mat for -1 action. If this works it can save using tokens at all. @Gendo: I've only just got to playtest banner, I'll reply later if it doesn't work. Your thoughts are fair; I guess ultimately the card came from groping with the idea of putting cards on different Supply piles. This was kind of a final possibility before fully concluding the idea doesn't work at all. This is coming back to how it first was, though withou the Treasure playing. I hadn't considered that was why it was too good, so I will give this a go. Thanks. First of all, I see no good reason to open with Town in this case. Except maybe that you don't mind losing Town to Warrior as much, and Road can't be trashed. For a moment after writing this I thought that costing Road at 3$ might solve the issue, but either you'll just get it after you have Champion out, or a player might try to drain the pile before you get one, at which point you also get one, and Warrior does what it does best, namely ruin the game by trashing your key cards. If I'm at that, I'll admit that I hate Warrior with passion, so Road/Champion never shows up for me as I have come to veto the Page line. Champion is part of a card that, in my opinion, is a terrible play experience either way. Call it apologetic, but I can't help but feel this makes the problem less dire. However, not everybody sees it that way. So, if you DO like the Page line, does Road ruin the game? I don't think so. First of all, all Road does is draw your deck. But drawing your deck isn't exactly something only Road can do. True, you can draw a deck of any size with a single Road. But how many times do you have to spend 4$ to make it halfway likely to draw one regularly? It's a super strong combo - but Champion is super strong regardless of Road, and as Road does NOTHING but draw, perhaps you can get something better instead? As I said, drawing your deck isn't exactly impossible without Road, so maybe I can have all of this with a deck that's better in the meantime, possibly gets me to Champion faster? Even if Road WAS a must-buy in Page games, just like with Chapel, there's still plenty of wrong decisions to make besides this one. Road/Champion is not Rebuild. I hope this sheds some light on my view on this. The only thing that irks me is that, technically, Road allows for infinite turns. To fix this, I could add a condition to the wording: +2 Cards. If you drew any cards this way, put this in your hand." Wanderers feel like they should be events. I like the idea of a rotating event pile, though. But making them events follows naturally from the rules that exist, instead of thinking of them as a new type of card that "can't be gained or trashed". (If you have no <dept>,) you may gain a non-victory card costing up to 8$ to your hand. Take <1> per $ the card costs. Yes, I do agree with this, because the Wanderers are a bit too swingy as they are. Making them rotate so each player can access them during a full round of turns is fairer. The current cards would need a revamp, and, well, what would they do that current events don't? Or would they still be bought? Could they be things to use actions on, or could they be passive effects? I have these ideas going around at the moment. So what are your thoughts on the Gathering type? I find the text on the cards to be self-explanatory, but I suppose it's easier for players to see 'gathering' and think 'we put VP tokens on this pile then'. This is what led me to do the Multi type. The Gathering type exists only so that Defiled Shrine can refer to these cards. Unless you need to refer to such cards specifically, there is no need for an extra type. Ditto. Cards should not have a type solely based on their on-play effect. Reserve says hi. Though I'm on record as stating that reserve really shouldn't be a type. Or at the very least, Distant Lands shouldn't be one. The rest of them should have probably been reactions. But as it stands, reserve means nothing other than "has the on play effect of moving to your tavern mat in addition to other effects." Yeah, Reserve type is a stretch. But I think we can all more or less agree that Multi should not be a type. Great cards, especially the playtesting&updating and the Action token concept. It could be implemented via a one-shot non-Supply Reserve card but the token is simpler in practice. About Advancing Village, I like the cap but think that it still so good that it might have to cost 4. Its main advantage over Coin of the Realm is that the later frequently stays on the Tavern mat when you shuffle wheras Advancing Village accumulates tokens. Because of that you might even open with it in some Kingdoms. Incinerate does not need an extra buy. All the trashers that do have one, Forager, Trading Route and Salvager, are also (conditional) payload cards which can make use of the extra buy whereas a multitrasher rarely does. I like that Incinerate makes Cursers slightly weaker. Locusts runs into scaling issues. Assuming that every player only buys one Locusts you can use it on average 5 times in a 2P game, 3.3 times in a 3P game and so on. So perhaps use 4x # players Locusts per pile in a game? It is hard to judge though what x should be in the case of an 'on average x times and then self-destruct' cantrip trasher that costs 4. I like how thematic the card is with the pile eating. Agree with everything here. First I compared AV to Village, sometimes it looked worse when it gave no immediate actions, but in balance an action token is better than a +action. Then that it can give 2 of them makes it good in the games you can do so. Yes, it feels like it should cost more, and testing showed no problems with that. Take the +buy off and it looks weak compared to Chapel. It isn't there to try making it a later payload card, trying to get the $1 often wouldn't be a good idea. It's there so players can simply buy a Curse if they want to try accelerating their trashing, especially for the games with no cursing Attack, and if not it gives reason to choose it over Chapel in such a game, something for it to do after the deck is trimmed. It was +action and gain a Curse on buy at first, but a) this set didn't need an extra non-terminal and b) who wants to be forced to get junk with their trasher? Too many Locusts I feared would empty the piles too fast, but that was during the first version when they gained and trashed on play rather than end of turn. They may be slow enough now to merit several. They could always be a 12 card pile like Port though, so everyone can get an even share of them in any size of game. Dairy - Action Reserve, $5 cost. At the start of your Buy Phase, put this on your Tavern mat. At any time during your Action Phases, you may discard this from your Tavern mat and -1 action. I put Textile Mill in this format, but it's a really tight squeeze on cardspace. This feels similar to Wine Merchant but plays differently enough. For the issue of theme, I renamed it Dairy, you send the produce to your tavern. Take the +buy off and it looks weak compared to Chapel. Doesn't everything look weak compared to Chapel? I doubt that Incinerate makes you want to buy Curses. It is a net extra trashed card plus a Coin at the cost of having to draw an additional, dead card and match it with Incinerate. Note that the net extra card that you can trash if you trashed a Curse is only something you opt to do if you have Incinerate and 4 junk cards in your hand and this no earlier than after the 2nd shuffle. You rarely have lot of nonterminal draw at this point to increase your handsize so you are more likely to draw Incinerate with only 2 or 3 junk cards. This is why Incinerate is probably more of a hedge against Cursers than a card that incentives you to buy Curses. I'm going to take out the problematic Banner. Seeing that it's a variant on a principle that has come up more than once on this forum, that of putting a supply card onto a different pile, I thought it good to write my thoughts against it for any fan card creators who come to the same idea. With the introduction of split piles I anticipate this being more likely. Banner - Action Victory, $4 cost. Return this to the supply. Move a Banner onto a different Supply pile that doesn't have a Victory on top. Cards on that pile cannot be gained or bought before it is. When you buy this, gain the card under it. It wouldn't just change 5-costs into 4, but any cost; Platinum, and even Fortune and the other Debt-cost cards could all be bought for $4, with the intention that the player would get a junk card with it for balance. With hindsight, Banner isn't really a junk card. You can use an action to remove it from your deck and put it on a pile irrelevant to the game, even if that's Curse, and you can then run the risk of giving the same power to your opponents. Besides this, you could use it aggressively to try denying piles to your opponents, like those that cost cheaper or those that depend on being bought like Mint. This denies the pile to yourself too, which you may not always want to work around. Both Rabbits and Banner have in-built ways to still allow gaining cards from the piles they sit on. With a card that doesn't, a game with it and no extra buys would see any chosen pile completely denied, taken out the game. No player will want to use a precious buy and turn on that card just to open up the cards underneath, as it will not progress the deck's payload. Rabbits' impact on a game will vary depending on the presence of other sources of +buy. If there are no others, the only way to gain a card from a pile it sits on, and avoid the total denial problem, is by playing another Rabbits. 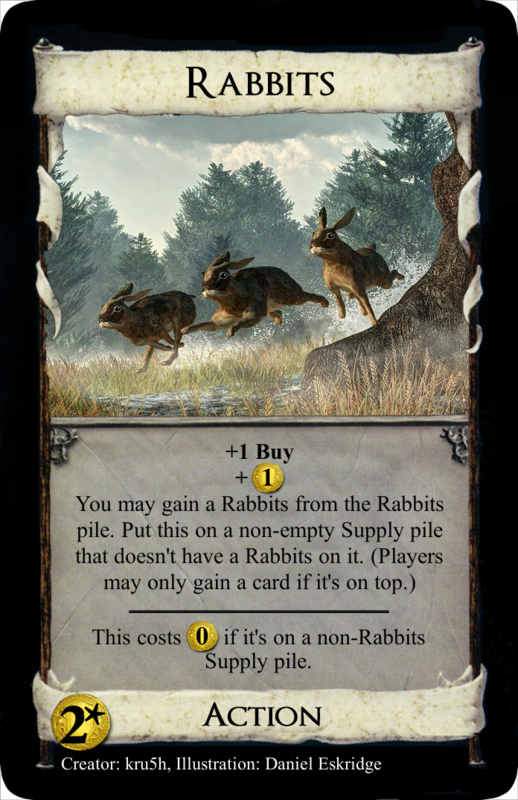 This boils down to two outcomes: either there are few Rabbits out because few are bought, and a player is likely denied a key card to their strategy because they don't have a Rabbits on a turn they can afford it; or there are many out because many are bought, and that leads seamlessly to my conclusion. And if there are other buys, Rabbits become more like attempts at junking the opponent, but that eventually come right back at you. My conclusion with all such kingdom cards that move onto other piles is this: they may add extra variety to games, but, with the greatest respect to kru5h and his Rabbits, I do not personally feel they are a welcome addition. They take away from all the central strategy elements of the game and instead make it more a mindless process of 'buy whatever's available and see what happens'. And from there I find it's impossible to balance Banner. 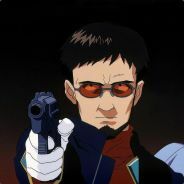 No cost is fair yet effective, for if it's too low it's too powerful at letting players buy whatever they want, if it's too high you can totally eliminate more piles, and if it's in the middle like at $4, as Gendo said it has little point. This version is far too strong; it's better than a Grand Market and a Capital (minus 1 buy) put together on one card. I admit that the +2$ together with the gaining to hand are too much and one should be dropped. I'm finding it hard to decide which Innovator variant is better at the moment, the one I have on the OP with Treasure play and needing 2 actions, or Asper's variant not involving debt at $4 cost. Neither show themselves imbalanced, but the former is certainly hard to work out when throned. But one card I have plans to change is Expert. Look at the card and you might at first think 'that's nice, a really flexible card', like me. But, what does it actually add to a game? How does it impact a kingdom/board? Someone else's first impression of the card was 'boring' and now I see why - it's nearly always just a strictly better version of another card, nothing different. Patent - Action, $6 cost. Choose one: +1 card, +1 action, +1 buy or + $1 , then treat this as the card on your Patent mat. When you first gain this, choose an Action card from the Supply costing up to $4 that is not on any other player's Patent mat. Put it on your Patent mat. Functionally, it might play better at $7 cost allowing $5-costs on the mat. More usability, but maybe more problems with it. Until your next turn, each other player may only buy 0 or 2 cards during their Buy Phases. The vanilla might be on the weak side for $5. Or it could be balanced like this for $4, a bit more playtesting needed yet. It does do more consistent damage though, unlike before. While this is in play: the first two times you gain a card, take an action token; when you spend an action token, instead of +1 action play an Action card from your hand twice. You may discard a card. If you do, take an action token. Each can now be cheaper. +cards on Magnate-d tokens seems unnecessary by how it now plays out, but it may be that its gaining and playing tokens are to be separated so that you choose one or the other. It can collect quite a horde of them. AV is kind of boring, and I may add some kind of on-trash ability to make it interesting; first that comes to mind is gain a card costing up to $4. Trash a card from your hand. + $1 per $2 it costs. If it isn't an Action or Treasure card, trash up to 2 more cards from your hand. Revolters can give an action token on its second effect instead of +1 action, don't see why not. It should help the card more. And I think I have a solution coming together for the Wanderers, but I'll leave that for later. Even if you drop the "to hand", it's still close to strictly better than Grand Market. If you only drop the +$2 instead, it's far better than Capital when used on non-Victory cards, but can't be used on Provinces, which might or might not be balanced. Either way, the card seems too similar to an existing card to me; thus I'd rather stay closer to Asper's original card. What about adding a Storyteller-like clause to it? You may play a Treasure from your hand. Pay any amount of $. You may gain a card to your hand costing at most the amount you paid. This would be close to a non-terminal Armory even if you only play a Silver, and potentially far better with more virtual $. Shuffle the Wanderers pile at the start of each game. During their Action Phase a player may use an action to play the top Wanderer, moving it to their play area until they are returned to the bottom of the pile at the stated time. They are a pile of landscape cards that players may or may not want in their games, and for those who want it sometimes there can be this randomiser card. Whether the general rule of only 2 events/landmarks/Wanderers piles would be followed or if they would be separate from this I'm undecided. Warband - put 2 cards from your hand onto your deck. Each other player with more than 4 cards in hand does the same. Return: end of your turn. Roadshow - each player draws up to 6 cards in hand, and looks through their discard pile and puts a card from it into their hand. Return: end of your turn. Circus Troupe - each player reveals their hand to the player on their left, and they choose a card. Each player then draws a card and puts the chosen card onto their deck. Return: end of your turn. Forger - move a Copper from the Copper pile onto a different Supply pile of your choice. Cards under it cannot be gained or bought before it is. Return: end of your turn. Yes, I said what I did earlier about moving cards onto other piles, but most of the problems come from the feature being usable multiple times and throughout the game when on a kingdom card. On this Wanderer I think it works. Scrounger - each player trashes up to 2 cards from their hand. Return: end of your turn. Caravaneer - while this is in play, if a player has at least $2 unspent at the start of Clean-up, they draw 2 extra cards for their next turn's hand. Return: start of your next turn. Secret Dealer - each player puts their deck into their discard pile and gets +1 buy at the start of their next turn. Return: end of your next turn. Roadblock - while this is in play, after cards are drawn or gained into a player's hand other than at Clean-up, they are immediately discarded. Return: end of your next turn. Royal Visit - while this is in play, after cards are discarded or trashed from a player's hand other than at Clean-up, they are returned to their hand. Return: end of your next turn. Refugees - +1 action. Each player takes an action token. Reveal the Wanderer that is second from top. Return: end of your turn. You can keep it constantly revealed, so you could move the top card up to make the second card's instructions visible. So this set is all about card movement, including several things you couldn't see on an Action card. Each one will have a very different impact depending on its timing and the kingdom, to hopefully provide many new experiences. Saying this was almost strictly better than Grand Market is like saying Candlestick Maker was close to strictly better than Market. You can't just ignore a +1 Card on a nonterminal Action card. That's not to say I don't like the Treasure suggestion. (If you have no ,) you may gain a non-victory card costing up to 8$ to your hand. Take per $ the card costs. You potentially gain a card to your hand, hence Holger's comparison to Grand Market. You may play a Treasure from your hand. You may pay any number of $ to gain a card costing the amount to your hand. Doing all your buying in the Action Phase might be too broken with Mission, so it may need Black Market's wording. And here are some ideas that seem so simple I wouldn't be surprised if I saw them on these forums somewhere. Cards (everywhere) you haven't gained copies of this turn cost $2 less, but not less than $0. Take an action token. You may discard a card, to take another action token. Steelworks - Action Attack, $5 cost. Gain a card costing up to $4; or if you have used 3 or more actions this turn (counting on this) it may cost $5. Each other player reveals the top 2 cards of their deck, trashes one costing the same as the card you gained, and discards the rest. The current Steelworks would be called Glassworks if this turns out well. I was looking for something that would work as a Conspirator variant counting used actions during a turn, and saw how a Workshop could potentially do. Fairly boring by itself, I then added the Attack.